The digital photos we are all accustomed to are bitmap images, composed of pixels. In contrast, a vector image or graphic is formed by independent geometric objects, which can be segments, lines or polygons. Each one of these objects is based on mathematical expressions, and their points have a definite position on the x and y axis of the image area. Why are vector graphics so wonderful? Their versatility. Vector graphics are like superheroes: at the click of a button or the drag of a mouse you can change their shape, colour and size, and they will still look amazing. Firstly, each object can be manipulated separately even if they overlap other objects in the image. They can be copied and pasted to create separate graphics, and can easily be assigned a different color, shape, thickness and fill. Secondly, from a business card to a billboard, vector images can be scaled without distortion or resolution loss. Their lines & render are crisp and sharp at any size and they can be printed at infinitely high resolutions. Needless to say, everyone who works in graphic design absolutely swears by them! 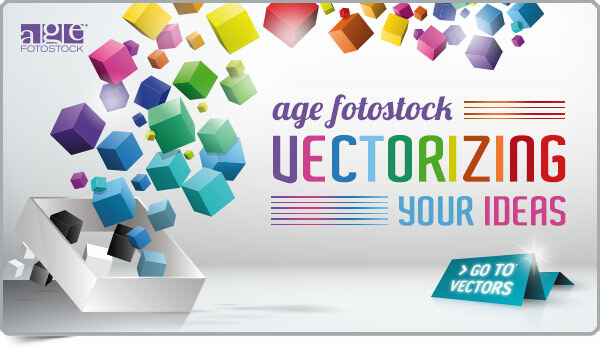 All age fotostock’s vector files are in .EPS (Encapsulated PostScript) format, a highly customizable format that allows you to use the image as a vector as well as a bitmap. .EPS files can be opened in Adobe Photoshop, but the best way to work with vectors is to use a vector editing software such as Adobe Illustrator or Corel Draw. Like photos, .EPS files can be LBRF, RF or RM. The file size of a vector is based on how complex or difficult the image is, how intricate the lines are and how complicated the points are, not on the size or colour of the image. The download time for an .EPS file cannot be easily estimated as it depends on the file size, the type of connection the client uses, the state or saturation of the connection, and other factors such as the number of internet applications being used on the computer during the download. Feeling jumpy? Need to stretch? Let a vector do it for you!! !